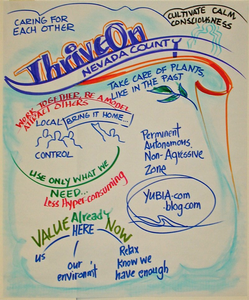 ThriveOn Nevada County was one of the first groups to form early in 2012 and organize using the THRIVE 12 Sector Solutions model. 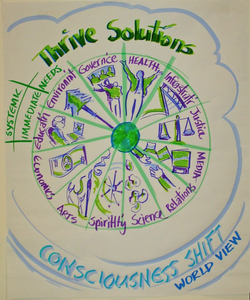 It is a Nevada County-wide movement made up of enthusiastic citizen’s who are developing local networks that can supply the goods, services, and healthy environment needed to thrive, while reducing dependence on the global economic system. 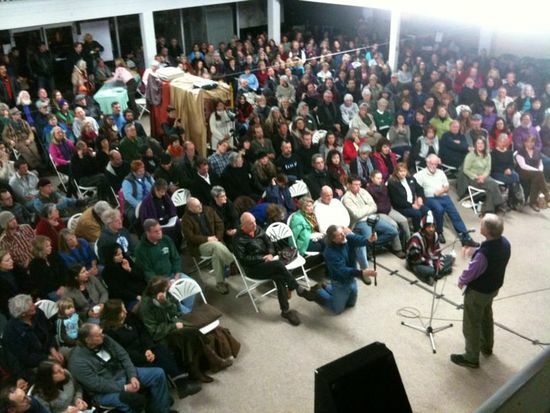 The first ThriveOn Nevada County meeting had more than 400 people attend! They all watched THRIVE together followed by a Q & A session with Foster Gamble, and then discussed the Thrive Solutions Model and broke out into the 12 Sector groups. Some groups remained stronger than others, including a very active MEDIA group, which is making a documentary film about their activities and a SPIRITUALITY group that meets regularly. They also found that members were particularly interested in FARMING (which could be considered part of the Environment Sector), FREE ENERGY (Infrastructure) and HOMELESSNESS (Justice), and have formed groups around those issues. The group addressing homelessness has developed a successful program for the homeless in Nevada County to receive what they refer to as a “hand-up” rather than a “hand-out.” They do this by connecting the homeless with local farmers, who offer credit for food and housing in exchange for work on the farm. This helps both the farmers and the homeless, feeds those who are hungry, and provides shelter. The various Sector groups continue to meet on a regular basis and all members get together once a month. You can learn more about ThriveOn Nevada County on Facebook and ThriveOn.org.